Photographers Hanna Moon and Joyce Ng explore being “lost in translation” in this new exhibition. Sofia Coppola’s 2003 cult flick Lost in Translation saw Bill Murray and Scarlett Johansson as two Americans navigating life and loneliness in Tokyo. 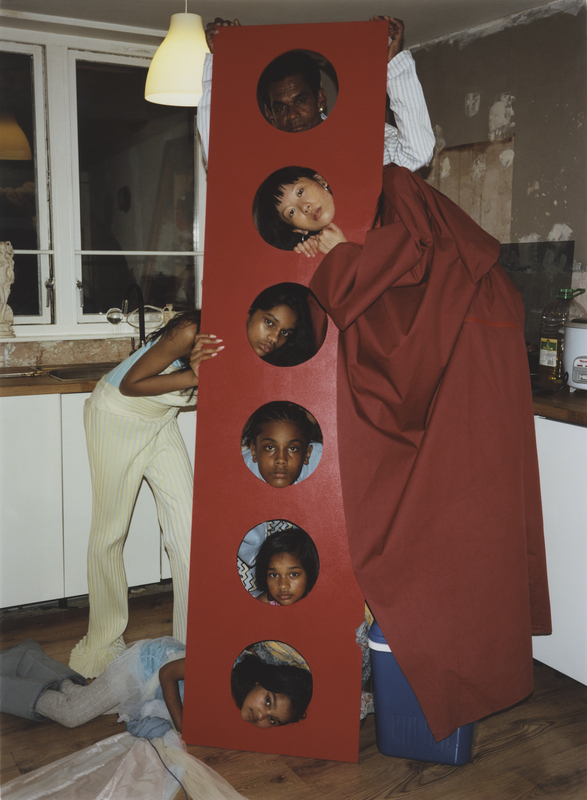 And now, a new exhibition delves into the very same phenomenon, but IRL for London-based Asia-born fashion photographers Hanna Moon and Joyce Ng, respectively hailed from South Korea and Hong Kong. Hosted at London’s Somerset House, English as a Second Language, explores otherness. Alienation. Frustration. Fear. Humour. All the things that come with sussing out life in London when English isn’t your first language. Hanna: We both met whilst studying at Central Saint Martins, but we weren’t really friends in the first year. Joyce was really timid, and I was the opposite! I also deliberately wasn’t really hanging out with Asian students – even if they weren’t Korean – because I wanted to learn English as soon as possible. We only properly became friends just before producing our final year projects, while on our year out in New York. We were always working together for our publications: Joyce, for example, did some styling for my magazine. I think that at that stage of creative development, there isn’t really much to judge someone else’s work by; but our mindsets worked well together, we understood one another’s style. What does “English as a Second Language” mean for you? Hanna: I think it represents our identity in a nutshell, but not in a negative way. I came to Central Saint Martins as an international student and I couldn’t even speak English when I first arrived. The whole thing was very Lost in Translation – living and working in the UK and having a different cultural background. I think this feeling ironically can inspire something totally unexpected. For me, being ‘lost in translation’ doesn’t mean a struggle, it means unlimited possibility. Joyce: I started using the abbreviation “ESL” as a quick comeback excuse for misinterpreting anything in English. I grew up going to schools where speaking my Chinese mother tongue was against school rules. Now at 27, I’m still embarrassed that both my English and Chinese is diluted and never 100% correctly used. But I have to look at it completely differently. It’s an asset to have both languages as ongoing streams of consciousness in our brains. What are the main themes the exhibition approaches? Hanna: Our mutual feeling of being “lost in translation” is definitely one! It’s quite literal. When I first moved here there were a lot of things that I would interpret differently to how they were meant to be. It doesn’t just come down to language, though; it can apply to everything. You always understand things in your own way. For example, how I take or understand British culture might be different to what British culture actually is. It’s a positive thing though: I think that having worked in the fashion industry with our backgrounds has given us the ability to create something close to chemical reactions, to be able to bring together diverse references and to make magic happen. We’re mixing all these elements through us to create a body of work. We don’t necessarily know what we’re trying to say, we’re just showing ourselves. We’re the ones “lost in translation”, and it’s a quality that allows us unlimited possibilities for creativity: we have no idea of what the result of bringing all of these elements together will be. Joyce: It’s how we approach image-making. It’s part of who we are: we still, sometimes, use the wrong words, or the way we use English might be a bit off-the-mark. It affects the way you think and interpret things, as well as the way you work. Hanna: I got to know Shonagh, the curator, through her previous exhibition Posturing. Me and Joyce were both part of the exhibition and she became interested in our work through it. I think she has always has been interested in the meaning of beauty and diversity in fashion, and wanted to explore how our cultural upbringing and education influences how we see the world and how this translates through our images. Joyce: I think there were multiple layers in Shonagh’s thinking. It’s easy to group us under the Asian category, but Hanna and I are very different. The way we interpret language and symbols sometimes separate us on another dimension of thoughts, as opposed to someone who grows up in a mono-dialect world. We both came to London not expecting what was to come after our English education, and we left university with an altered way of communication. Where else have you gotten your inspiration from? Joyce: I’m constantly people-watching. Street-casting is an important element of my work, and it forces my introvert self to fake confidence and speak to strangers. I’m drawn to people who are introverted like myself and those who are often pleasantly surprised to hear I find them beautiful. As part of my new series of works created for the exhibition, I casted directly from Somerset House’s visitors over the course of six weeks. I would meet people, then ask them about their background. I’d build a story with that, or come in with my own story, merging the two worlds. 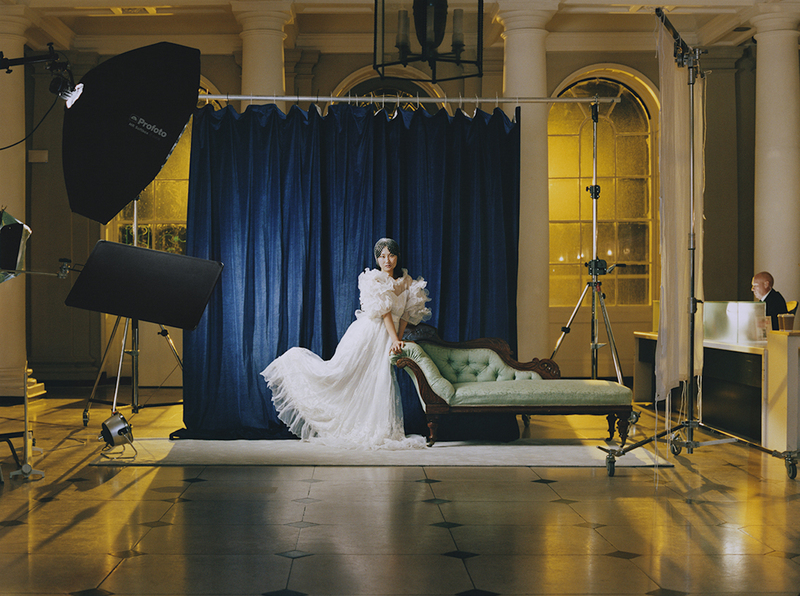 Hanna: My idea was to “invade” Somerset House and transform it, shooting images of my two best friends Moffy and Heejin in different locations at night. I wanted the images to have different layers; I introduced traditional set-ups, unconventional models, traditional poses and props and brought all these elements together to create something which feels in itself lost in translation. What’s your favourite image? What’s the story behind it? 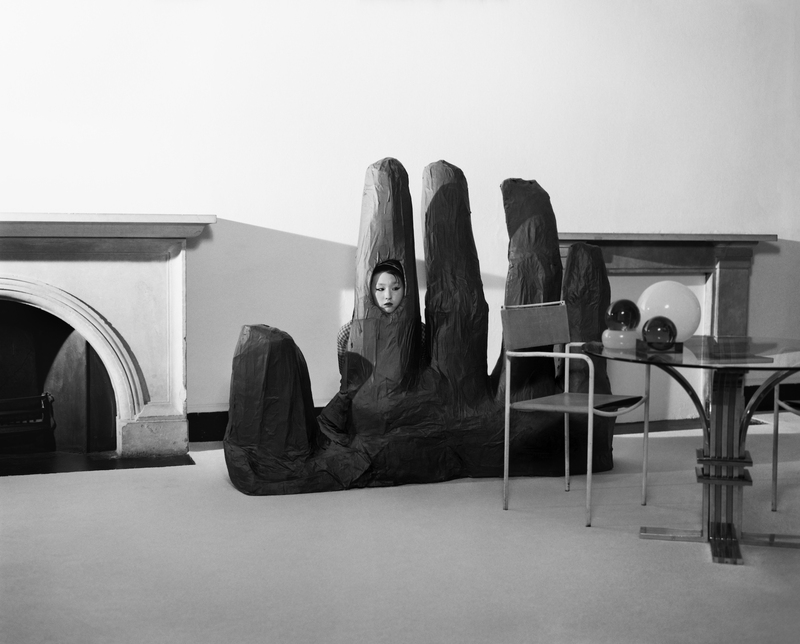 Joyce: I shot two images of a Chinese student called Guan Yin, who I’d spotted at King’s College during freshers’ week. I played with the idea of her having just arrived in London. We shot on the rooftop of Somerset House, in front of the London Eye, and the most obvious icons in London. It was kind of like her sending a postcard home telling her parents she’s safe in London. The final image in the series is of the same girl in the “Mountain of Five Fingers’”, which is mentioned in Journey to the West, a famous Chinese novel. I made a sort of pun on the novel, using the images to depict a journey travelling through space in different ways to the west.